An iconic tour goes out with a bang. Tonight marks the final stop on Beyoncé's Formation World Tour, and as expected, the finale offered up some high-profile surprises. 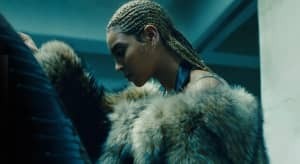 Most notably, Bey brought out FADER America Issue cover star Serena Williams to reprise her role in the video for "Sorry." The tennis icon showed up to take a seat in the throne onstage and dance, amid typical B show freakouts. Later on in the show, Beyoncé also brought out two more guests: Kendrick Lamar and her husband Jay Z. Hov joined B to perform "Drunk In Love," while Kendrick took the stage for a high-energy rendition of "Freedom." This was the first time that Jay Z and Beyoncé have performed together since the release of Lemonade. Check out the videos above and below. Read Serena Williams' FADER cover story here. This post was updated at 1:21 a.m. on October 8 with new reporting.